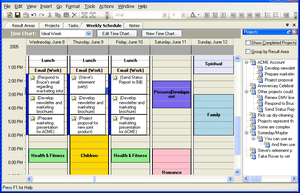 Now I've come across a lot of programs in the past that deal with time management. These system usually demonstrate an ease of use and a flawless system that is guarenteed to produce viable results. Now I am not the most motivated person at the best of times (unless it relates to something that interests me) and procrastination is something that is fairly commonplace in my work ethic. I have found in the past, that planning out a work schedule, allotting time for me to complete scheduled tasks, and sticking to these time frames tends to lead very tangible results for myself. I came across some time management software today though that actually does seem to be able to produce effective results for its users. In line with techniques that I have tried to implement before, this program gives you the ability to map and plan your schedules in a spread sheet environment, and enables you to prioritise your workload, to ensure the most vital components are completed first. This sort of software would be perfect for large scale projects, and jobs that require very tight schedules. Something that I probably need to get a better grasp of!